Come out and run a beautiful trail on Historical Mining Property just south of Saint Louis. 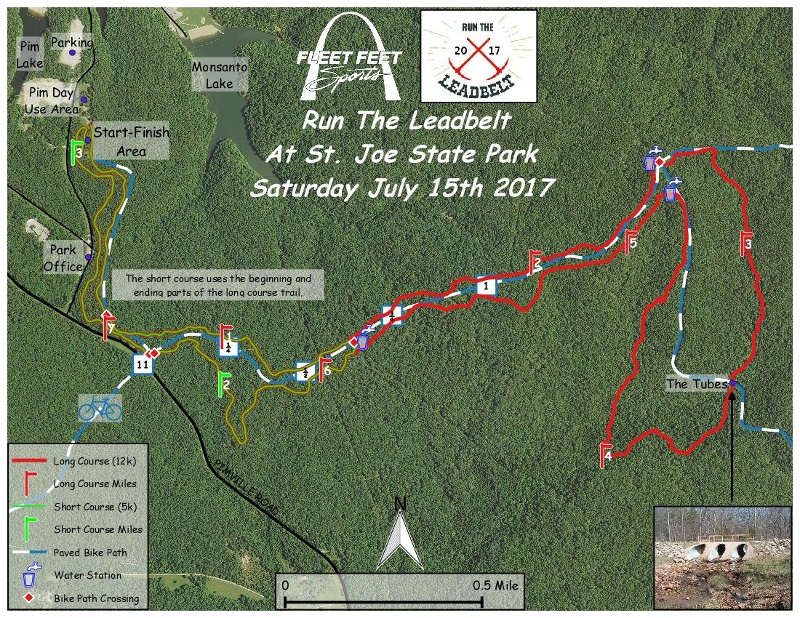 The Leadbelt course at St. Joe State Park is a unique trail that is open all year with little traffic on it and then prepped and buffed for a race weekend each July. You will run through a mix of beautiful Missouri hardwood forest, Pines, Creek Crossings, Open Savanna and yes you run through the culvert. The Park has other amenities for the you and the family to take advantage of while there. There is a swimming lake near the race start, picnic areas, a 12-mile asphalt bike path and the Leadbelt course will be open all day for more running or mountain biking. Register for both Run the Leadbelt 5K/12K (7/14) and Leadbelt XC Marathon class(7/15) for a chance to win the Miner Tough Growler! Top Male and Female each win! Click here for more information about Leadbelt XC Mountain Bike Race! Swag | Online entries through 7/2 will receive an event trucker hat as well as a free Full-Service Car Wash Coupon from Auto Spa Etc. Cash or check only accepted on race morning as payment. No credit cards. Course | Course Map. The 12K course will be a mix of beautiful Missouri hardwood forest trails, a culvert to run through, a couple of creek crossings and a savanna section. The 5K course is an abbreviated version of the 12K with mostly beautiful Missouri hardwood forest trails. The 5K is fairly flat with less than 200 ft of elevation gain. Awards | Top 3 Male/Female Overall for both 12k and 5K will receive awards. Top 3 Male/Female in each age division will receive unique Cowbell Award.